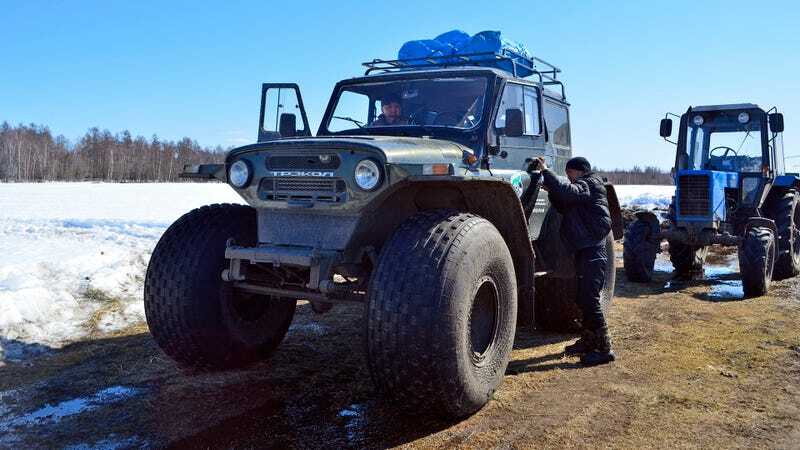 What you see here is a TREKOL amphibious truck based on an UAZ-31514. It costs $26,500 worth of rubles, and the Russian space program uses it to find the stages falling off their Soyuz rockets, no matter how far in the woods they end up. On the 28th of April, Roscosmos launched a Soyuz-2.1a type rocket from their new ‘Eastern Spaceport’ that happens to be in Russia instead of Kazakhstan. The Soyuz is a three stage rocket, which means quite a few parts of it fall back to Earth without burning up during reentry. So far, Roscosmos’ search teams managed to find four bits of the puzzle, in remote locations in the Sakha Republic and the Amur Oblast. Local environmental experts also took samples from the crash sites to see whether the kerosene and oxygen based propulsion system had any impact on the soil or water. To get there, the crews use helicopters as well as TREKOL’s amphibious trucks, based on the light and highly capable UAZ. As the search continues, Roscosmos will use drones and helicopters to find the rest of the metal and carbon fiber fragments before their scientist can have a look at them at the Vostochny Cosmodrome, the launch place that is scheduled to be ready in 2018, ending the Russian space program’s dependence on Kazakhstan once and for all. After that, all what’s left of the Soyuz 2.1a gets recycled, just like an old plane. All I can tell you is this: If you’re out there in the Russian wilderness huntin’, fishin’ or fourwheelin’, always be vigilant.